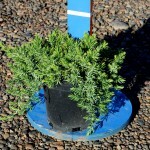 A low, trailing groundcover with attractive, blue-green foliage. The habit is compact with superior foliage to the species. It is especially adapted to sandy coastal soils. It prefers full sun and a well-drained soil is essential. Useful low maintenance ground cover, it can trail over a bank, and is great in mass plantings.